I was lucky enough to take my four children on an 11 night backpacking trip to the Sangre De Cristo mountains of New Mexico. We saw many beautiful sunrises as we were up every morning before daylight. We filtered water from mountain streams, camped at 10,000 feet and forded streams. We covered just about 100 miles and spent the Fourth of July on top of Mount Baldy at 12, 441 feet. We encountered some challenges along the way as any backpacker does, but what a wonderful trip it was! 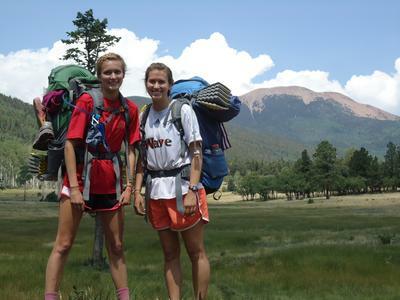 I encourage every mom to take her children backpacking and camping as often as possible. We have taken our kids camping since they were babies and just started backpacking in the last few years. It is a great way to make family memories. It is awesome to watch your children (even as adults) bond with each other and depend on each other and work together while on a backpacking trip. A funny comment from one of my daughters, "I knew there would be dirt, but I didn't know I would get THIS dirty!"